Assembled in Japan investigates one of the great success stories of the twentieth century: the rise of the Japanese electronics industry. 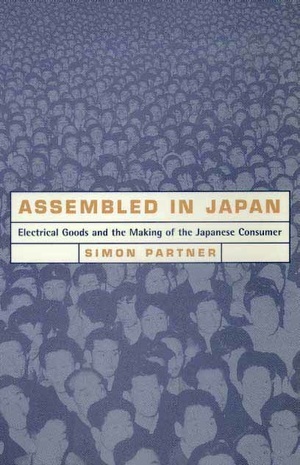 Contrary to mainstream interpretation, Simon Partner discovers that behind the meteoric rise of Sony, Matsushita, Toshiba, and other electrical goods companies was neither the iron hand of Japan's Ministry of International Trade and Industry nor a government-sponsored export-led growth policy, but rather an explosion of domestic consumer demand that began in the 1950s. This powerful consumer boom differed fundamentally from the one under way at the same time in the United States in that it began from widespread poverty and comparatively miserable living conditions. Beginning with a discussion of the prewar origins of the consumer engine that was to take off under the American Occupation, Partner quickly turns his sights on the business leaders, inventors, laborers, and ordinary citizens who participated in the broadly successful effort to create new markets for expensive, unfamiliar new products. Throughout, the author relates these pressure-cooker years in Japan to the key themes of twentieth-century experience worldwide: the role of technology in promoting social change, the rise of mass consumer societies, and the construction of gender in advanced industrial economies. Simon Partner is Assistant Professor of History at Duke University and author of Saying Yes to Japanese Investment (1992) and Mergers and Acquisitions Manual (1991).